Beautiful!!!!! What every girl loves and wants classic diamond studs!! Clarity and cut wonderfully set. 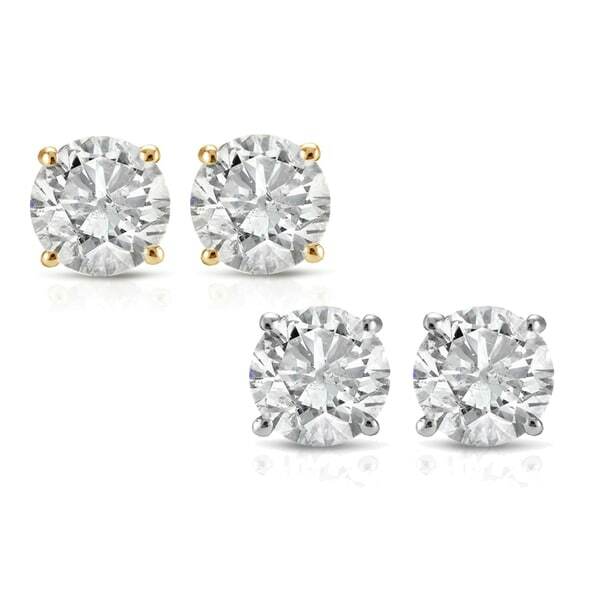 Bring chic sparkle to your look with these stunning diamond stud earrings. Crafted from your choice of 14-karat white or yellow gold, each earring features a lovely round-cut white diamond, set in a four prong basket. The shimmering earrings secure with butterfly clasps for comfortable and easy wear. All weights and measurements are approximate and may vary slightly from the listed information. *T.W. (total weight) is approximate. 1/2 carat T.W. may be 0.45 to 0.57 carats. Treatment code N (diamond). See Treatment Guide for further information. I really love my 14k White Gold ½ ct TDW White Diamond Stud Earrings. Great work earrings. The diamond has a nice shine to them. The earrings are large enough for you to see while inside of your piecing. The stud backing was hard to pull off and put on with short nail. I’m unable to wear fake jewelry because my ears are sensitive. My ear hasn’t broken out because of the earrings. The one star reviews got it right on this one. Figured the one star reviews were just the complainers, and bought anyway. One of the diamonds contained such a large and prominent inclusion that it can be clearly seen even when holding the tiny thing at an arms length away from me. So be wary if you buy these intending to wear them out and about, if you have any face to face conversation while wearing them the person might be too distracted by an inclusion to pay attention to you. LOVE LOVE LOVE these earrings. For the price they are beautiful!! Why spend thousands & thousands of dollars on earrings when you can get beautiful one's like these! The earrings are beautiful and look wonderful. The setting on these earrings is perfect. The color of the diamonds are very clear and bright. Highly recommend these. My diamond earrings are beautiful! 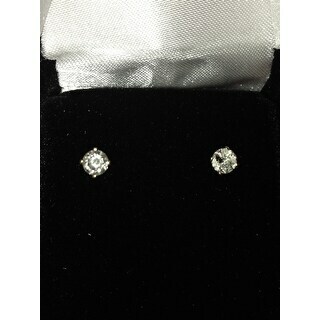 Lovely diamond studs...I love them. Dissapointment runneth over! Not worth the price! I have purchased diamond jewelry before, but this purchase was a letdown. No sparkle, can clearly see carbon spots on surface, diamonds are cloudy. Needless to say this will be a return. Beautiful earrings. Perfect for a new teenager's birthday. I was pleased with the sparkle and the construction. The setting and posts were also well made so that the earrings went into the ear with ease. I know these will be a treasure for many years to come. My son really likes them.he asked me to buy him another pair more karats. Yeah right! You get what you pay for, But they worked for the occasion. Great for the price... had to replace the backs because they were just loose push backs but other than that the earrings were suitable. My wife really likes them. They were a gift, so don’t remember exactly. But if they were smaller than 4 mm, I would have returned them. Definitely not bigger than 5 mm. "Is each earring 1/4 carat or is each earring 1/2 carat?" Each earring is 1/4 carat. I had already ordered mine before I realized it, but they are cute. Great price just in time for Valentines Day. Hello abcd1234, we are unable to guarantee that anything other than earrings listed as hypoallergenic are completely nickel free. Thanks for shopping with us! Diamond stud earrings are probably the most versatile accessory you can own. Check out these tips on how to buy diamond earrings to help your search.